Treatment centers for eating disorders and substance abuse may offer inpatient or outpatient services, although inpatient care is usually used for those with these coinciding conditions. Seeking help from a treatment center that specializes in treating both eating disorders and substance abuse addiction will help address the issues underlying addiction. Bulimia is a condition made up of two components. Binging: The first is repeated episodes of binge eating where a person will eat significantly more than an average person during that period of time. During this period, the person will feel a lack of control or power to stop the eating. Purging: The second component is a “purging” behavior to avoid weight gain. These behaviors may include vomiting, using laxatives, not eating for an extended period, and excessively exercising. Despite these behaviors, someone with bulimia may appear at normal body weight. Anorexia is characterized by the fear of gaining weight and restricting food from the body. A distorted self-image and excessive weight loss are common. This kind of eating can also lead to metabolic and hormonal disorders. It is more common for women to suffer from this disorder, but men may also suffer from anorexia. The reported ratio is 10 women for every 1 man diagnosed with this disorder. The severity of anorexia is determined by the body mass index of the individual. It should be noted that binge and purging behaviors may occur within the framework of anorexia as long as the other symptoms of anorexia are present. Binge eating occurs when a person eats a large amount of food in a short period of time. The person may feel a loss of control during this time. People with this eating disorder do not typically purge their food, so a person with this disorder may be overweight, depressed or secretive of their food habits. Eat until they are full to an uncomfortable level. For example, purging disorder is the act of vomiting or using medications like laxatives to modify weight or physical appearance. This is different than bulimia nervosa because purging is not proceeded by a binge. Another example may be a person who does binge-eat, but not on a regular basis – they may binge less than once a week and/or for less than 3 months at a time. Obesity is not quite the same as being overweight. Obesity means the person has excessive body fat. This can have an adverse effect on health, and it is diagnosed when a person’s weight is 20 percent or more above normal. Obesity is a physical condition that may be the result of a mental health condition. Each of these conditions may be treated best in an inpatient facility that is trained to deal with eating disorders and substance abuse. 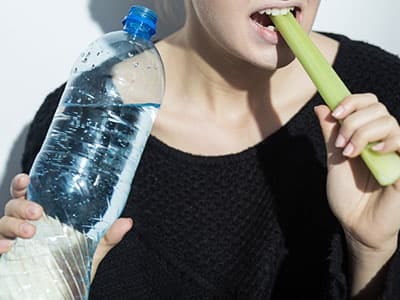 Substance abuse, like alcoholism or drug addictions, can make symptoms of eating disorders worse, so addicted individuals will likely need to go through detoxification before the rehabilitation aspect of the program begins. Inpatient programs allow the individual to be seen by medical providers 24 hours a day, so any problems can be treated as they arise. This is good for those with eating disorders, as the staff will be better able to monitor what foods a person eats and when someone eats, as well as the side effects related to withdrawal symptoms from drugs or alcohol. After detoxification, you may work with therapists who can help you your eating disorder. Therapists may offer cognitive behavioral therapy performed in an individual or group therapy setting. Cognitive behavioral therapy trains a person to respond to stress or anxiety in different ways, making it easier to avoid eating improperly. This is done by understanding the connections between thoughts, feelings, beliefs and behaviors. Rehab centers will help you get back to a healthy weight while improving your mental health. All rehab and recovery treatment centers will be focused on getting you back to a healthy weight while improving your mental and physical condition. Simply doing this can eliminate many of the side effects that a person may be struggling with such as dizziness and tiredness. Medications may be used to treat anxiety or depression, which can further help individuals heal from the eating disorder. Finding a treatment center for eating disorders and substance abuse is within reach. Call us at 1-888-319-2606 Who Answers? at any time to discuss your options. We want to make sure that you or your loved one gets the treatment necessary for a healthy lifestyle. Blog: Is DBT Effective for Treatment of Eating Disorders? [1.] Grilo, C. et al. (2002). Eating Disorders and Alcohol Use Disorders. National Institute on Alcohol Abuse and Alcoholism. [2.] CASA. (2003). Food for Thought: Substance Abuse and Eating Disorders. Report. New York: The National Center on Addiction and Substance Abuse (CASA) at Columbia University. [3.] American Psychiatric Association. (2013). Diagnostic and statistical manual of mental disorders: DSM-5. Washington, D.C: American Psychiatric Association.